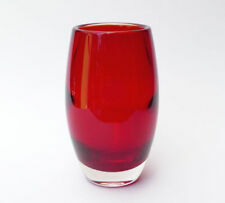 Blomglass vase in ruby red designed by Arthur Percy for Gallaskruf glassworks in Sweden and dating back to the 1950s. Beautiful elegant shape amd a great addition to any glass collection. In good condition with no chips or cracks. There are some small scratches to the main body as shown in last picture but are not very noticeable when on display. Dimensions: 25cm tall x 10cm at widest point. Happy bidding and please look at my other items. No cracks. Complete with original whitefriars label. Red Finnish Riihimaki Lasi Oy Glass Aitan Lukko Vase by Helena Tynell. Red Finnish Riihimaki Lasi Oy Glass Aitan Lukko Vase by Helena Tynell. . Condition is Used. Slight chip just below rim but doesn't affect decorative strength. Dispatched with Royal Mail 2nd Class. Whitefriars ruby red knobbly vase. 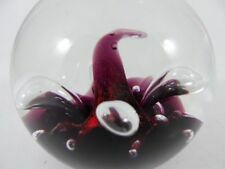 Whitefriars ruby red dilly duck glass paperweight. Condition is good, the base shows light wear commensurate with age and they is a very small rought patch at the base of the tail made during manufacture. The controlled bubbles catch the lights and the duck displays very nicely. Duck is 14 cms tall and weighs 551 grm. Caithness Glass Millefiori Red Heart paperweight in excellent condition. It has a little red heart in the centre and a concave top. Whitefriars Ruby Red Large Greek Key Vase Pat Number 9810. Up for sale is this large whitefriars ruby red textured Greek key vase, pattern number 9810, it measures approx 7.3/4 inches high by approx 2.1/2 inches across at its widest point, it is in excellent condition with no chips cracks or scratches but does have a bubble on one side which does not detract from it on display, (I only mention that for accuracy) payment PayPal only please I normally dispatched the next day after payment thanks for looking. The uncommon Tuulikki range was produced in four differing shapes catalogued as Riihimaki 1517 - 1520 which were all around 7 to 8 " in height. She worked for a short period for Arabia and even as an air hostess for Finnair. Kosta Boda Green Swirl /Candle Holder. 6 cm high in very good condition but please look at pictures to make your own mind up.Dispatched with Royal Mail 2nd Class uk ,but would post abroad for extra cost. Whitefriars Ruby Red Glass Bowl. 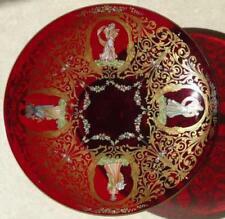 Small Whitefriars Ruby Red Bowl. Mid Century Retro Scandi style Red Glass Vase. Dispatched with Royal Mail 2nd Class. RIIHIMAKI FINNISH ART GLASS RED VASE designed by TAMARA ALADIN having lovely warm Red colour and solid Clear glass base. No label or makers mark. Size------------------------------------18cm tall. Each tankard has been tested and found to be fit for purpose. approx dia ;; 6 cmm. Wedgwood Red glass Apple Paperweight. Wedgwood is etched to base. The colour catches the light beautifully. Riihimaki's notable Five designers include Tamara Aladin, Helena Tynell, Nanny Still, Aimo Okkolin and Erkkitapio Siiroinen. In studying and having owned the vast majority of these designs my opinion to the designer of this vase falls very firmly on the lap of Aimo Okkolin. 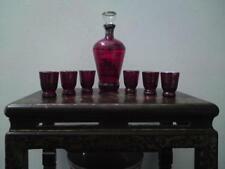 Venetian Glass decanter and 4 shotglasses gold/enamel on red glass. Condition is Used. Dispatched with Royal Mail 2nd Class. By MONICA BRATT for REIJMYRE. Stunning Mid Century Red Art Glass Jug Pitcher. Tapered Jug with red Applied Handle. Size - 32cms tall x 10cms at base x 7cms at rim. I aim to describe all faults as fully as possible. 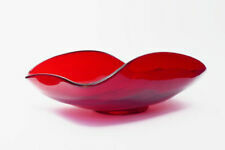 New listingVINTAGE MURANO SOMMERSO ART GLASS DISH IN BRIGHT RED SHADES. Murano bright red coloured cased glass dish or bowl very vibrant in colour probably from the 1960s or 70s, does have a small chip & afew very minor ones around the top edge, sizes 5cm tall & 11.5 across. BEAUTIFUL HAND BLOWN WHITEFRIARS GLASS APPLE PAPERWEIGHT. IT HAS A POLISHED PONTIL UNDERNEATH. IN VERY GOOD CONDITION. Vintage Retro Scandinavian Holmegaard Carnaby Vibrant Red Hooped Glass Vase. 2 x VINTAGE WHITEFRIARS GLASS VASES with TRAPPED BUBBLE DEEP RED " REDUCED "
AROUND THE 1970'S IN AGE. GOOD CONDITION. Condition is Used. This is a nice example of a classic Whitefriars design, dating to the mid-20th century. This piece can be seen on page 10 of the 1964 Whitefriars catalogue, and has the pattern number 9410. 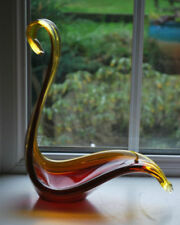 New listingLarge Heavy Vintage Red And Amber Ribbed Murano Glass Vase. Up for sale is this large vintage 60s 70s Murano Art Glass Vase, the vase is Amber And Red with clear glass ribs, it measures approx 12 Inches high by approx 7 inches across at its widest point, it weighs approx 1600grms unpacked, it is in excellent condition with no chips cracks or scratches payment PayPal only please I normally dispatched the next day after payment thanks for looking. Framed Handcrafted Fused glass art perfect as a gift - 20cm x 20cm. Beautiful original fused glass art created in my own studio in Yorkshire. Each piece is fired in my kiln and is therefore completely unique. My designs are inspired by the beautiful Yorkshire Countryside. Each item will be securely package and dispatched via Royal Mail 2nd Class recorded . Condition is New. Dispatched with Royal Mail 2nd Class. Beautiful necklace. Complete with original gift box. It's been an ashtray, peanut holder and pot pourri bowl. Lovely condition Bohemian Red Cut Glass Tankard (probably Victorian). LARGE VINTAGE RED CASED GLASS VASE RIPPLED 8.5" DARTINGTON? Unknown maker but could be Dartington. Rippled vertically. Large cased glass vase. There are remnants of a label but nothing can be deciphered - a good quality vase. Moncrieff’s Monart Glass Vase. Very good used Condition . Dispatched with Royal Mail 2nd Class signed for. Cc design 16 cm tall Original label on base Early 20th century. A stunning combination of red glass cased in a band of amber glass, which is further encased in an angular block of clear glass. A fantastic addition to any glass collection. Hand Blown Red Glass Vase with White Spiral Overlay. "Small Nick in Overlay at the Rear of the Vase. I am not a professional photographer. I try to take the best image I can that shows the item clearly. This bowl has a lovely red colour stood on a clear foot. THREE ART GLASS VASES. No flaws that I can see Dispatched with Royal Mail 2nd Class. MURANO GLASS RED AMBER & CLEAR SOMMERSO FREEFORM JUG/VASE 1960S 6"
Very tactile, it is lovely to hold and the optical quality is fine; its only flaw is a slight roughening to the spout, presumably from wear; this is quite hard to see although I can feel it with my thumb. Ruby Red Whitefriars Jug with Clear Handle. #9419 5” tall, 2.5” wide by base. No chips, scratches or scuffs. GOLD DECORATION & TWISTED STEM. GOOD CONDITION. The latter supports 4 outward facing large facets whose form resembles a stylised Crown with two chevron shaped angled sides that support a horizontal base and a pointed pyramidical or chevron shaped summit. Whitefriars ruby red knobbly vase 6 inches.